Godlyke Power-All Extension Jumper Godlyke Power-All extension / adapter / jumper cables. 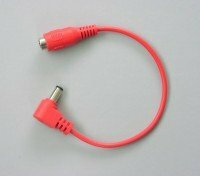 2.1mm right angle extension: This cable features a 5.5mm x 2.1mm right angle plug on one end and a 5.5mm x 2.1mm in-line jack on the other end. It is part of the Godlyke Power-All system but can also be used to adapt other power supplies or their cables. The “jack” can be connected to any 5.5mm x 2.1mm plug. This includes any Power-All daisy chain, Power-All Y splitter or directly to the PA-9 itself. Conversely the 2.1mm plug can be connected to power supplies with 2.1mm outputs. Approximately 10″ long. 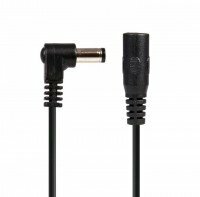 2.1mm straight extension: This cable features a 5.5mm x 2.1mm straight plug on one end and a 5.5mm x 2.1mm in-line jack on the other end. It is part of the Godlyke Power-All system but can also be used to adapt other power supplies or their cables. The “jack” can be connected to any 5.5mm x 2.1mm plug. This includes any Power-All daisy chain, Power-All Y splitter or directly to the PA-9 itself. Conversely the 2.1mm plug can be connected to power supplies with 2.1mm outputs. Approximately 10″ long. 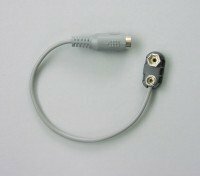 2.1mm right angle extension, REVERSED POLARITY: This cable features a 5.5mm x 2.1mm right angle plug on one end and a 5.5mm x 2.1mm in-line jack on the other end with the polarity reversed. It’s typically used on pedals needing a center positive connection. It is part of the Godlyke Power-All system but can also be used to adapt other power supplies or reverse just about any cable. The “jack” can be connected to any 5.5mm x 2.1mm plug. This includes any Power-All daisy chain, Power-All Y splitter or directly to the PA-9 itself. Conversely the 2.1mm plug can be connected to power supplies with 2.1mm outputs. Approximately 5″ long. 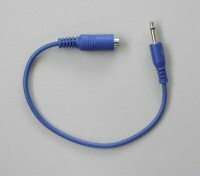 2.1mm straight extension, REVERSED POLARITY: This cable features a 5.5mm x 2.1mm straight plug on one end and a 5.5mm x 2.1mm in-line jack on the other end with the polarity reversed. It’s typically used on pedals needing a center positive connection. It is part of the Godlyke Power-All system but can also be used to adapt other power supplies or reverse just about any cable. The “jack” can be connected to any 5.5mm x 2.1mm plug. This includes any Power-All daisy chain, Power-All Y splitter or directly to the PA-9 itself. Conversely the 2.1mm plug can be connected to power supplies with 2.1mm outputs. Approximately 5″ long. 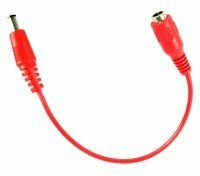 2.5mm right angle extension: This cable features a 5.5mm x 2.5mm right angle plug on one end and a 5.5mm x 2.1mm in-line jack on the other end with the polarity reversed. It allows the user to power Line-6 modelers, some Electro-Harmonix units and other digital effect units from the PA-9. The PA-9 can power up to FOUR Line-6 Modelers while still having power remaining for other effect units. This cable is part of the Godlyke Power-All system but can also be used to adapt other power supplies or their cables. The “jack” can be connected to any 5.5mm x 2.1mm plug. This includes any Power-All daisy chain, Power-All Y splitter or directly to the PA-9 itself. Conversely the 2.5mm plug can be connected to some power supplies (such as the Pedal Power AC) with 2.5mm outputs. Approximately 10″ long. 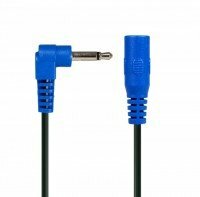 2.5mm straight extension: This cable features a 5.5mm x 2.5mm straight plug on one end and a 5.5mm x 2.1mm in-line jack on the other end with the polarity reversed. It allows the user to power Line-6 modelers, some Electro-Harmonix units and other digital effect units from the PA-9. The PA-9 can power up to FOUR Line-6 Modelers while still having power remaining for other effect units. This cable is part of the Godlyke Power-All system but can also be used to adapt other power supplies or their cables. The “jack” can be connected to any 5.5mm x 2.1mm plug. This includes any Power-All daisy chain, Power-All Y splitter or directly to the PA-9 itself. Conversely the 2.5mm plug can be connected to some power supplies (such as the Pedal Power AC) with 2.5mm outputs. Approximately 10″ long. 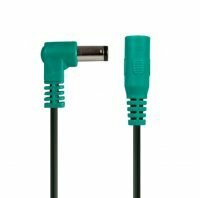 3.5mm right angle mini plug extension: This cable features a 3.5mm right angle mini plug on one end and a 5.5mm x 2.1mm in-line jack on the other end. It’s typically used on pedals needing an 1/8″ (or 3.5mm) phone plug with a positive tip. It is part of the Godlyke Power-All system but can also be used to adapt other power supplies or their cables. The “jack” can be connected to any 5.5mm x 2.1mm plug. This includes any Power-All daisy chain, Power-All Y splitter or directly to the PA-9 itself. Conversely the 3.5mm plug can be connected to some power supplies with 3.5mm outputs. Approximately 5″ long. 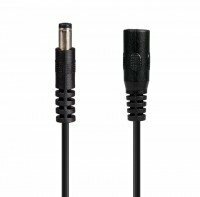 2.1mm straight extension, REVERSED POLARITY: This cable features a 3.5mm straight mini plug on one end and a 5.5mm x 2.1mm in-line jack on the other end. It’s typically used on pedals needing an 1/8″ (or 3.5mm) phone plug with a positive tip. It is part of the Godlyke Power-All system but can also be used to adapt other power supplies or their cables. The “jack” can be connected to any 5.5mm x 2.1mm plug. This includes any Power-All daisy chain, Power-All Y splitter or directly to the PA-9 itself. Conversely the 3.5mm plug can be connected to some power supplies with 3.5mm outputs. Approximately 5″ long. Battery clip extension: This cable features a battery clip on one end and a 5.5mm x 2.1mm in-line jack on the other end. 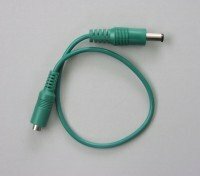 It’s typically used on vintage and boutique pedals that do not have a normal power cable connection, only an internal battery connector. It is part of the Godlyke Power-All system but can also be used to adapt other power supplies or extend their cables. The “jack” can be connected to any 5.5mm x 2.1mm plug. This includes any Power-All daisy chain, Power-All Y splitter or directly to the PA-9 itself. Approximately 5″ long.